Cat allergies are on the increase. Cats in the wild don’t suffer with allergies. But our poorly cared for domestic cats do and the problem is escalating. Why do I say that our domestic cats are poorly cared for? Many people feel that domestic animals are cared for better than wild ones, who have to feed, shelter and protect themselves. Surely our domestic cats are better off? For many reasons I feel that cats fare much better in the wild. The reasons I discuss here are so we can better care for those who grace us with their presence. I am extremely grateful for the cats in my life and would feel bereft without them. I feel honoured and privileged, and I am well aware they are doing this for me, not the other way round. Cats are free spirits. They love nothing better than to bask in the sun, lazily swiping at a passing fly or fully engaging in the pursuit of a hunt. Nature is in perfect harmony and cats play their role, whatever your thoughts are on hunting cats. Small animals, such as mice, breed at a high rate, providing ample food for hunting cats. This is how cats evolved. Their digestion is perfectly adapted to the whole small animal, bones, organs and all. Their teeth are perfectly adapted to crunching up on small bones. Some cats are even good at fishing. Now compare this fresh, wholesome, balanced diet of a typical wild cat to the normal commercial cat food that abounds and is heavily promoted by vets? Typical commercial cat food, including the expensive ones, contain left over carcass rejects from human sources, usually that have been processed in a rendering plant. So the ‘meat’ is of very poor quality. This is then bulked out with any cheap carbohydrate available. 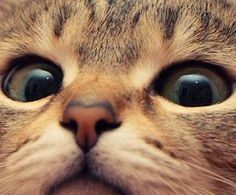 Some ‘grain-free’ cat foods contain tapioca, a carbohydrate with no protein. Yet wild cats’ diets contain the highest possible amount of animal protein. They cannot survive (at least not in a healthy way) on anything less. 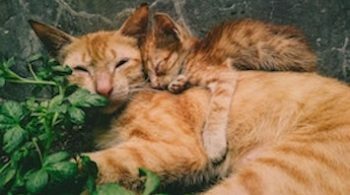 If a cat’s diet is badly off course from the one they evolved on, then they cannot remain healthy, and illnesses such as cat allergies will abound. As day follows night. There are other serious problems with commercial cat food, but let’s move on to freedom of choice. A wild cat has a choice of hunting their preferred tasty morsel. They have a choice in where they live – they can travel to a better location. They can choose where they sleep. They can choose when they sleep. They can choose their life companions. 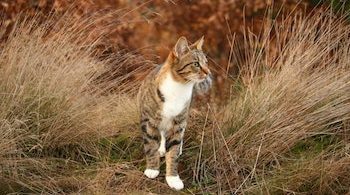 Domestic cats have little choice, often not even being allowed outside to enjoy the sun, the grass, the flying insects, the choice of herbal medication if and when required. Sometimes it is not safe for them to be outside, or not safe for the local wildlife. But some compensation needs to be found. A sunny ledge or a pot of herbs or grass are simple things to organise that can make the world of difference to our feline prisoners. Many people feel they own their cats. I feel I own my cats as much as they own me. So if they are ‘my’ cats, then I must be ‘their’ human. In truth, no-one can own another life. Sure, ‘my’ cats are under my care as opposed to anyone else’s, although that is not always a given with cats. This means that I subject ‘my’ cats to my way of thinking. If I feel that veterinary care is the best thing since sliced bread, then I will undoubtedly subject them to this, regardless of their feelings. However, if I am aware, awake and sensitive, then I can watch to see if they want this. In my own case, I have used vets a lot, forcing medication through disguised pills and injections, taking no consideration for the cats feelings, arrogantly feeling that I know best. Happily those days are in the long distant past. Since coming to homeopathy, now I always give my cats a choice. There is no disguising or subterfuge. Now I appreciate that they know far more than I do about what is good for them, especially about what is going on for them at any particular time. ‘My’ cats now choose their medication (homeopathic). If I get the remedy wrong, they soon let me know. Why is this important? 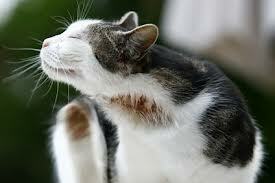 Cat allergies, indeed any allergies, come from a suppressed immune system. They may not immediately follow veterinary medication, although they often do. Veterinary medication, as indeed all medical procedures and drugs, suppress the immune system to get rid of the symptom. At any cost. Further and more serious ill health is an obvious consequence. 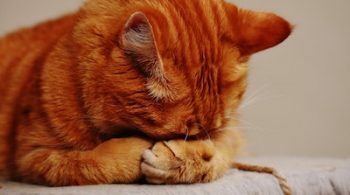 The only way a cat can develop allergies is through a depressed immune system. This can come about from a poor diet according to their evolution, unhappiness from being confined or having no choice, and suppressive veterinary care. Change those and you can expect to see the end of cat allergies as well as other cat illnesses.